If you want to extend your current jewelry business and double sales, be ready to sell your stuff online.Virtual jewelry shop allows to avoid middleman and have more control over every step of the sales process.Wordpress is an outstanding CMS and a good way to get started.All experienced users agree that Woocommerce is the best platform ever for jewelry and other fashion-oriented websites.You know that fashion is not just about visual attractiveness but functionality as well therefore we want you to stay informed with 5 well-designed and code-optimized WordPress themes. All of them offer needed features for really outstanding jewelry marketplace. All below-listed premium WordPress themes are fully compatible with default Woocommerce features and were built with SEO in mind.Unlimited options, custom widgets, drag and drop contentbuilder and many more.Also, feel free to promote your new store on the social media platforms where jewelry lovers hang out.Read this guide and be inspired to build Jewelry marketplace of your dream. DiCi is the headliner of our list and we are proud to start our review with this highly aesthetic premium class WordPress theme. Your customers will fall in love with really charming design and intuitive functionality. 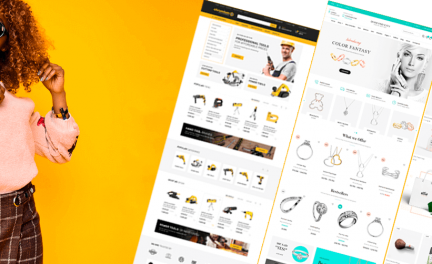 Mentioned jewelry theme is overloaded with powerful slider, custom widgets, user-friendly Elementor contentbuilder and many more. Theme package includes detailed documentation that is full of helpful tutorials and articles. All this additional info will ease the way of understanding how it can be installed and tuned as well. Contains info about all sophisticated features. DiCi build-in elements are fully compatible with Woocommerce and are styled according to the main smooth color scheme. Plenty of header and footer templates, different grid combinations and excellent behavior on tablet/mobile devices.Fast and easy to use. Modern HTML5, CSS3 animations and dreamy hover effects keep audiences interested and constantly returning for more. Contentbuilder and other default plugins require absolutely no coding and inner content can be edited with just a few clicks. 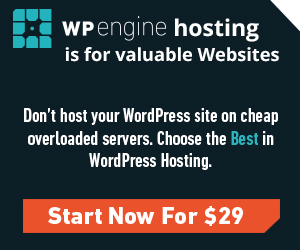 Only the most trendy plugins come with theme by default but optimized code allows to use great number of sided plugins. Custom icons and fonts can be applied as well. Charming slides, banners, customizable sidebars with widgets, collapsible navigational menus, lots of options and many more can be managed straight within WordPress Customizer. Page layouts are legible and well-oriented. Theme flexibility allows adding unique features and designs that reinforce your brand message. DiCi Demo Data is quick and easy to install with one-click import installer. Experienced support team is online 24/7 and always ready to discuss theme related questions if any. This Woocommerce theme offers the best user shopping experience. Royal – Jewelry Store WordPress theme was designed for the customers who want to sell their jewelry stuff online. This amazing and well-coded WordPress theme contains great variety of creative options to showcase what you’re offering. Beautifully crafted elements are available in the theme, this gives an opportunity to build aesthetically conscious jewelry store. Powerful CSS3 visual styling, gorgeous and polished HTML5 elements include impressive shortcodes, widgets and dynamic sidebars for product viewing as well. The theme is highly responsive that makes it compatible with all modern mobile devices. Royal – Jewelry theme is based on Woocommerce and had been integrated with a series of popular plugins for uncomplicated, one-step deployment. Engage your visitors in a memorable way, with the awesome slides of Revolution Slider. Tons of specialized documentation and polite agents from CrunchPress customer support center will do all the best to guide you through all theme features. 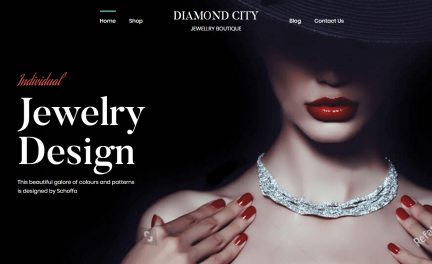 Your business site has never looked as good as it will ever be with Royal – Jewelry WordPress theme. Karo – Jewelry Responsive WooCommerce WordPress theme.So clean and delightful tool for selling jewelry, rings, necklaces, earrings, bracelets, pendants, diamond, gems, gemstones, jade, items made from gold, silver, platinum, for goldsmith, jewelry designers. This Jewelry theme is integrated with WooCommerce, built with Bootstrap and powered by Visual Composer.It supports proportional layout scaling and retina ready as well. Revolution Slider with faded effects, MegaMenu with multiple column styles, custom widgets and unlimited color schemes. Drag and drop contentbuilder’s functionality allows reordering elements of needed pages.SEO optimized and is built according to the latest web technologies. It is friendly with search engines. The code is clean,carefully-commented and maximum performance. By default, Karo comes with extensive documentation and great support. If you want to succeed online, don’t skip this trendy theme. It is another excellent WordPress template for any Jewelry Woocommerce website. Fast to load and coded to the highest standards. Just focus on your jewelry content and theme will do the rest. This good looking theme is so versatile, supports multi-languages.RTL support opens the doors to broaden your audience worldwide. So adaptive to all screens and browsers. Popular contentbuilder has build-in customizer that allows observing all layout changes in real time. Jewelry template is full of innovative and dynamic features. Smooth hover effects provide simplicity. Has many widget areas and looks great on all mobile devices such as tablets and smartphones. Brand-focused content will help to make connection with jewelry fans and keeps them coming back again and again. All the hard development work was done by experienced EM THEMES.Theme performs favorably across all the searches you’re targeting. Extensive documentation with great support will help to save time and doesn’t require any extra fees. Check out Jewelry eCommerce WordPress theme today. 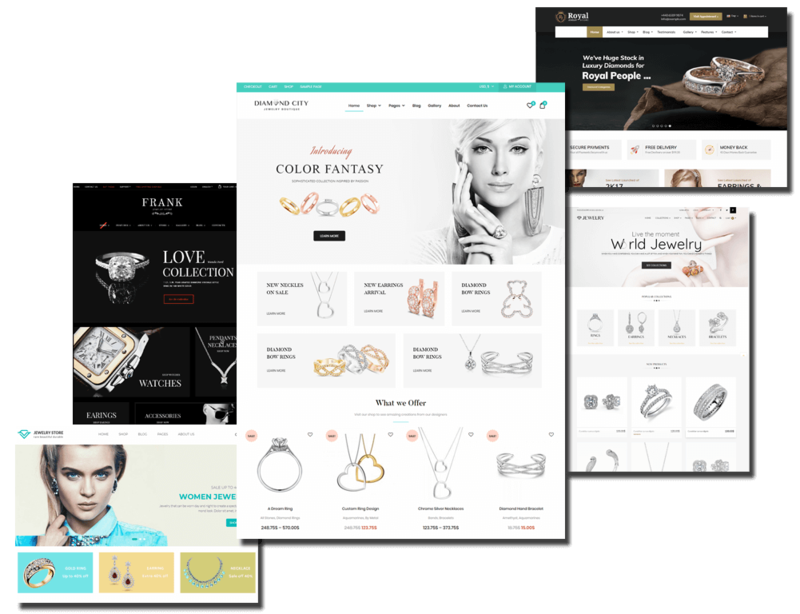 Let’s take a look at Frank – new Jewelry Woocommerce WordPress template from ThemeREX team. One of the most elegant premium quality theme that was specially designed for online jewelry store or some custom jewelry services. Feel relaxed while building your online store because mentioned template is full of pre-built pages. There is no need to spend even an hour, just implement one click demo installation and all dummy content will be downloaded almost immediately. 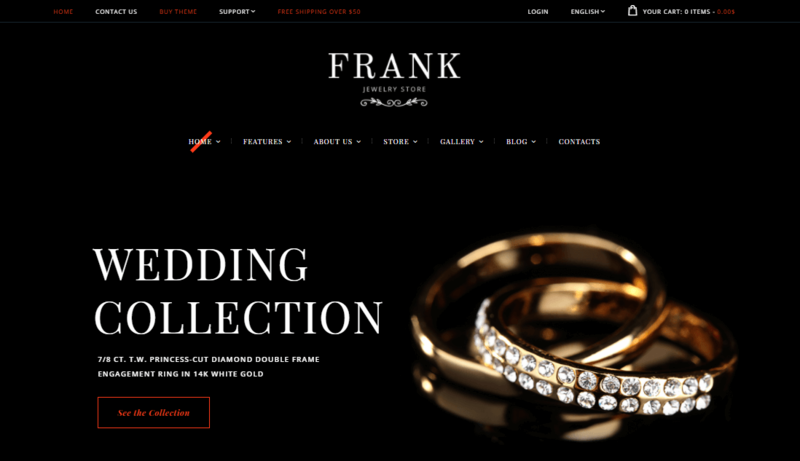 Frank – Jewelry WordPress theme comes in light and dark color schemes.WPML plugin compatibility allows switching between different language versions of your site. Coders made it compatible with ultimate pack of really awesome plugins that were chosen according to the latest web design trends. Here are some of them: Essential Grid, MailChimp, Instagram Feed, Slider Revolution, WooCommerce, etc. Custom fonts, icons, shortcodes and layout variations are included as well. Fully prepared for the modern landscape of social media, such as Facebook, Instagram and Twitter. Well-optimized code reduces page loading time. Feel free to ask pre-sale questions by submitting ticket to Franks’s customer support center and remember: with Frank theme on your side, your business will reach new heights!